Tyson and Mike were great to work with. Thanks guys! Great service from Spike. Staff is super friendly and accommodating. Could not have made things any easier throughout the process. Truly a wonderful experience! We have a vast selection of new Toyota vehicles waiting for you. Bought a vehicle from David A. Truly an exceptional experience , he was fast, friendly and efficient. Thank you David for being there for us!! Thank you Walser for the awesome free warranty!!! Rich was so easy to work with. We had gone in earlier in the week to look at a used car. Rich followed up with a call. We returned a day later and the car we were interested in was sold. However, he found a car far more desirable for us which we bought. It was a great experience working with him, there was no pressure to buy from him and we were in an out in a few hours, very, very satisfied with our purchase and his help. Awesome customer service and great salesman. They helped and explained everything I need to know about the car. Last of all they wanted me to be happy before I sign the deal. Thanks walsher toyota. Went to walser with a friend who was purchasing a vehicle for his fiancé and had the pleasure of working with Eric. He is a fantastic sales representative and I will refer anyone looking to purchase a vehicle to him from now on. Everything went smooth and great! I had Josh as my consultant and he was really nice and honest about everything. I would definitely recommend getting a car here. 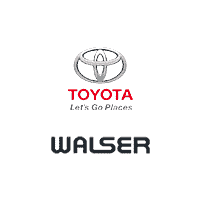 Walser Toyota draws in customers new and old the natural way: with top-quality automobiles, a sales experience focused squarely on the customer’s needs, and a little ol’-fashioned common sense.